The combination of freezing rain and temperatures hovering around zero is creating dangerous conditions on Edmonton sidewalks. For the 24-hour period ending Thursday morning, EMS in the city responded to 12 calls of people falling due to the conditions, says Alberta Health Services. On a typical winter day in Edmonton, AHS responds to about five such falls. After the freezing rain earlier in the week, AHS were called to 30 falls in a 24-hour period. 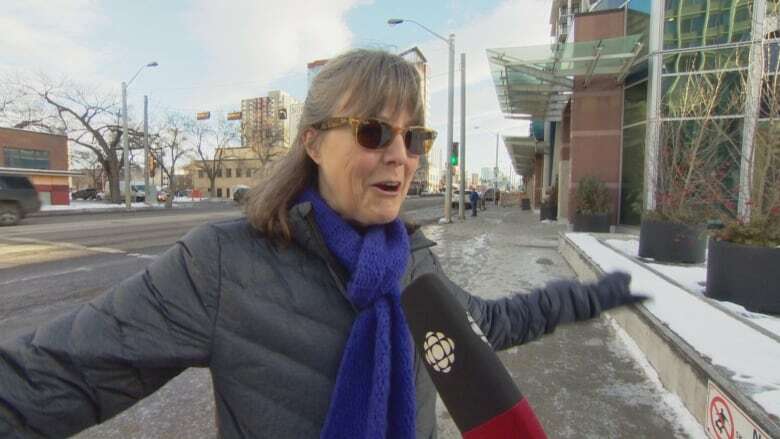 "It's really treacherous; it's just like glass," Leslie Watson said as she made her way along an icy Jasper Avenue on Thursday afternoon. "I have slipped, but I haven't fallen yet, thankfully." Watson doesn't mind looking a little silly in order to stay on her feet. "You do the penguin walk and hands out," she said. "That's my strategy, and smaller steps, keep your feet under your body." Watson's walk takes her across the 102nd Avenue bridge over Groat Road, forcing her to use a mix of residential, business and city sidewalks. "The city's property is actually some of the worst, particularly when you get close to the curbs," said Watson. "They had done a really good job on the bike path beside the bridge so I walked on the bike path but I didn't walk on the sidewalk on the bridge because it was just sheer ice." Watson would like the walkways to be safer, but isn't sure how the city can accomplish that. "It's tough to get out and do everything at once," she said. "And right now even the sanding, the sand is just staying on top of the ice." Watson hopes the warmer temperatures will allow the sand to sink into the ice and provide a bit more grip. Until then she'll just keep on shuffling. Further north, Svetlana Tsvenar and her 11-year-old daughter Raphaela clutched each other as they navigated a particularly icy stretch of sidewalk behind Rogers Place. "I try to put my comfortable boots [on] just in case, no high heel, and special [boots] for my daughter as well," Tsvenar said. "It's very icy and very dangerous." Despite the boots, Raphaela had taken a fall. "My legs are kind of hurting, but it's OK," she said. At a news conference Thursday, city spokesperson Paul Marinkovich said crews are sanding and chipping away at the icy conditions around the clock. "Over the past several days the city of Edmonton has received several freezing rain events including a substantial freeze-thaw cycle," he said. "I encourage any anyone that has any unsafe conditions to report them to 311 and they will be addressed as soon as possible." As the forecast is concerned, it's expected to be sunny through the weekend as the freeze-thaw cycle continues.